A total of 120 persons (Male-75, Female-39 and Children-6) attended the function. All attendees met their old buddies and enjoyed the event. A few more ex-employees joined the Association and became members. Mr. S. Abdul Mojib Qadri started the function with the recitation of Holy Quran. Syed Shahid Ali took over the stage. 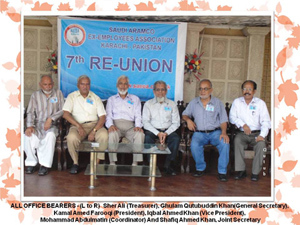 He introduced all SAEEA office bearers and then invited the President Kamal A. Farooqi followed by Engr. Iqbal Ahmed Khan, VP, to highlight the activities that occurred between the 6th and 7th reunion functions. Kamal Farooqi, President, first apologized to all the participants for the inconvenience caused due to unexpected hot weather. He announced SAEEA 1st elections to be held during the coming SAEEA 8th reunion. The election procedure will soon be communicated to all the Members. He requested all Members to cooperate with SAEEA Coordinators when it comes for arranging any future get together. He said SAEEA would appreciate the quick response of the Members. He requested all Members to inform SAEEA Office Bearers for news about themselves, their families and/or any other ex-employee. The current Ladies representative, Mrs. Mahtab Saeed Khan was not in a position to continue her responsibilities due to her family priorities. 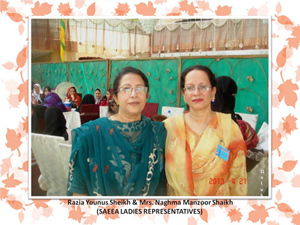 Kamal appreciated her work during her tenure and announced new names of two ladies; Mrs. Manzoor Shaikh and Mrs. Younus Shaikh, to act as Ladies Representatives. SAEEA invited male children of 10 SAEEA Members who died since the formation of SAEEA on October 11, 2010 as guests. A few children attended the function. Engr. Iqbal Khan depicted a brief overview of SAEEA history since its formation; October 11, 2010 and its gradual growth as of date. Dua was made for the deceased and quick recovery to ailing friends. Because of hot weather, a few attendees suggested to change the gathering place for next SAEEA function. Kamal agreed to look into this matter and assured guests of a definite change at the next function. The function adjourned on time as planned. If you have any questions then please call Engr. Iqbal Ahmed Khan on +92-321-701-4929 or write to him on [email protected]. View more SAEEA 7th Reunion photos in the AramcoExPats Photo Galleries. View a PowerPoint presentation of the event SAEEA 7th Reunion Presentation.